I am so happy tonight. I didn’t mind making one card but I really didn’t feel like making 3. So I was so happy when I managed to get them all into one card! The OCC challenge this week was Frame It! Create a Frame on your project. But it must be raised up off the base of the project. So, at first, I wished I had printed my image a bit smaller so I could place a Labels 1 frame OVER the image. So I pondered what to do and decided to place my frame UNDER my image! YEAH! 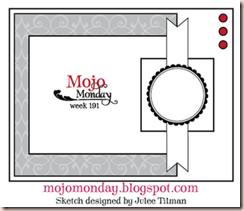 I also changed the proportions of Mojo Monday this week to fit the image and frame. I still think it’s pretty recognizable! 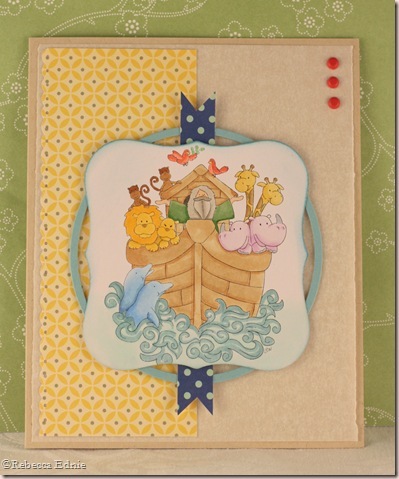 Be sure to pop by the OCC blog to check out all the fab projects our DT has for you. Don’t forget to visit their blogs and leave ‘em some love! Paper: tracing paper (instead of vellum)-art store, Seaside DP-October Afternoon, white CS-Xpress It, baja CS-SU! This is SO precious!!! What fabulous color choices! Love that ribbon too. This is so cute, your coloring is wonderful and I love the layout. Your colors and the over-all feel of your card are simply wonderful. Super cute, Rebecca! 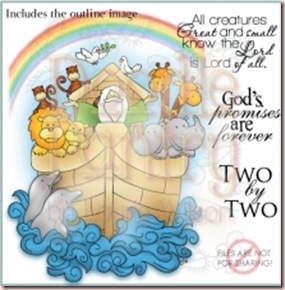 I love your adorable image and the way you used your frame – awesome card! way to be efficient…triple threat, I like that! lolGorgeous card Rebecca! great design!hugs & blessings! I really like the bright look of your card, and the layout is great (I can totally see the Mojo sketch!) Hope you are having a fantastic weekend! Very, very nice card Rebecca! So soft and beautiful! Look at you go, girl! What a great card, Rebecca! And how cool that you accomplished three challenges with one wonderful card!!! Great job, my friend! This is so cute, love the layout and your coloring is fantastic. Hi Rebecca, As always, your coloring and design are wonderful. Love how you turned the sketch. Such a great card.